Here’s Jun’s promo edit for CSF 2016 this Sunday (Sept 25, 2016), which looks to be a perfect New England Fall day! 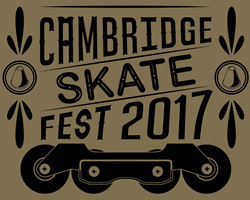 Cambridge SkateFest is an annual competition and demonstration event to celebrate the sport of inline skating. This includes freestyle slalom (technical footwork moves around a series of small cones), and a freeride course to showcase maneuvers, jumps, grinds, and slides.